Join us for this Easter holiday at Yarnton Home & Garden for a fun packed fortnight of activities. Get hands on cake decorating, potting up fabulous pots to take home with you and Easter crafts to decorate the home; or sit back and relax with our story teller. Monday 8th & 15th April: Cake Decorating, £2pp. 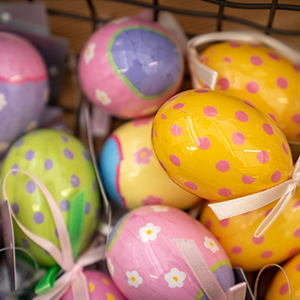 Friday 12th & 19th April: Korry's Easter Crafts, £2pp. We will also be running a free in-store treasure hunt where you will find out the name of the Yarnton bird by working out the clues. Each child who works out the name will receive a small prize each. Please collect this from the Customer Service Desk to begin. Places are limited and we highly recommend booking your preferred time slots so you don't miss out. You will only need to book spaces for the children attending. Adults go free.